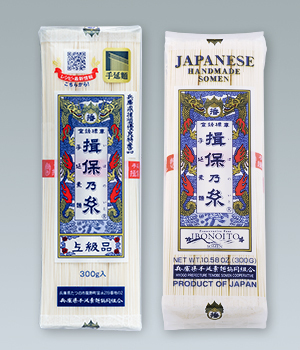 Made from the finest-quality flour, crystal-clear water from the River Ibo in the Harima area, and salt from Ako, Ibonoito tenobe (hand-stretched) Somen thin noodles are painstakingly manufactured by the most skilled culinary artists after being ripened several times through a traditional manufacturing process. 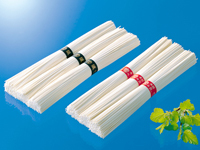 The entire process of manufacturing Ibonoito brand Somen is under the strict supervision of the Hyogo Prefecture Tenobe Somen Association. Following the ripening period in a dedicated storage house, it is distributed through exclusive agents only. Having plenty of body and feeling soft and pleasant on the palate, Ibonoito Somen is manufactured using a traditional process which has been preserved by the regulations of the Association. Each individual lot is checked by qualified inspectors, graded according to quality, and then stored in one of the Association’s 24 dedicated warehouses for tight quality control. Shipped during high demand seasons, Ibonoito Somen is delivered to consumers through 110 exclusive agents across the country. All of this distinguishes Ibonoito-branded Somen from other brands, always ensuring a leading position in the market.